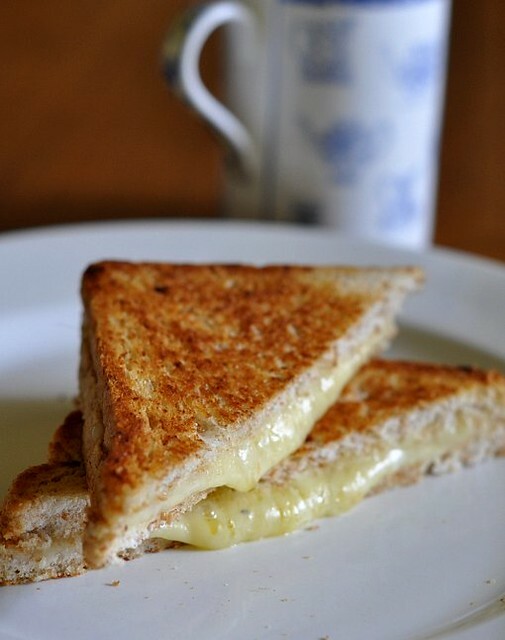 Cheese toastie (no need for fancy names like croque monsieur) is a simple and quick-to-do cheese and bread sandwich, either toasted or fried. Hi it's Monday and nothing I cooked over the weekend is interesting enough to tell you about. No. Wait. The stewed soy sauce pork came out better than--a bright blue kingfisher just knocked on my window, and it's 11:41 am, a bit late for calls. They usually come around 9 am--I've ever cooked ever it before. Even Hub said so when Wey shook his head in exaggerated praise. Check here for the revised version of my soy sauce pork. Where were we. Oh yes, I told you I've nothing to blog about today so this is an excuse to say hi to all readers who check in daily. It still thrills me when readers write to tell me what they've cooked from this blog and how their families enjoy their meals. Cooking at home is without doubt cheaper than eating out (leave that for weekends and special occasions) and definitely tons more hygienic, especially in this part of the world. I know it's a lot of effort for those in big cities with what seems like 12 hours instead of 24 but if you have kids especially, get into the kitchen and cook! Even the simplest meals can be more nutritious than the economy dinners in restaurants that are only cheap because the cheapest ingredients are used. Just check out the oil they use. My kids aren't hot about cheese toasties probably because that's mostly what they had to eat (and instant noodles, but the boys never got tired of that) while growing up but every time I eat a cheese toastie, I am surprised again at how delicious it is and I can't understand how anyone can get tired of it. So yes, this morning's breakfast was cheese toasties, (or for those who prefer, "grilled cheese sandwich") which everyone knows how to make. Come on you do. It's just melty cheese in the middle (I don't butter) toasted-fried in a frying pan with a bit of melted butter until crispy and golden on both sides (flip once only). If my thighs feel extra heavy, I skip the butter and just toast the toasties open (cheese on top of one slice of bread) under the oven grill. Get gooey cheeses like Gruyere, mozzarella, Gouda, provolone, Emmental, cheddar...so many. Choose the cheese for not just their meltability but also for their taste. I like all those cheeses that I mentioned but not Emmental so yes, be selective. What I used this morning was a combination of aged cheddar and mozzarella, grated coarsely because they came in blocks but slices are handier. If you like some variation, slap on a slice of ham or crispy bacon. For lunch, grilled tomatoes or pineapple or peppers make good sides for the toasties. Or in cold weather, a thick hot soup. Yum. Tip: be generous with the cheese. 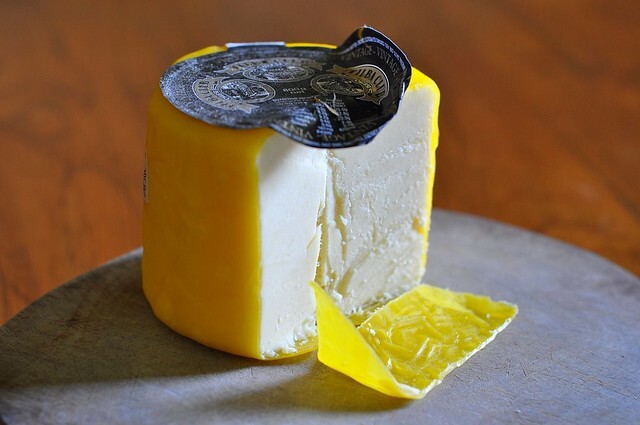 Tilda vintage cheddar, very tasty. You can get it in 800 gm blocks with a wax covering, from Vic Mart in Melbourne. It's aged, but not too much, quite smooth and not too crumbly or sharp. That's all for this Monday. I've said hi, now's your turn. heather: hi! 3 months to go ya?! sorry i am late to this toastie party. i must have been grilling a cheese sandwich. i like mine with crispy bacon and grilled onions on whole wheat in combination with a bowl cream of mushroom soup. i like to dunk the s/w in the soup the same way i do with donuts in coffee. i also like to believe there is no cholesterol in this meal ............. and that their will soon be peace in the middle east. i also like to vary it by using Gorgonzola and peperoni on slices of baguette or Italian bread, and dipping it in marinara sauce or pesto. instead of using butter on the grill i use garlic infused olive oil. "every time I eat a cheese toastie, I am surprised again at how delicious it is and I can't understand how anyone can get tired of it. " Oh this is so true. I have just rediscovered toasties. Its winter at the moment so a nice warm toastie for lunch makes everything seem a little less grey and gloomy. Not to mention it amuses my workmates.... they've moved on to paninis.. bah!